Angklung is an Indonesian musical instrument consisting of two to four bamboo tubes suspended in a bamboo frame, bound with rattan cords. The tubes are carefully whittled and cut by a master craftsperson to produce certain notes when the bamboo frame is shaken or tapped. Each Angklung produces a single note or chord, so several players must collaborate in order to play melodies. Traditional Angklungs use the pentatonic scale, but in 1938 musician Daeng Soetigna introduced Angklungs using the diatonic scale; these are known as angklung padaeng. The Angklung is closely related to traditional customs, arts and cultural identity in Indonesia, played during ceremonies such as rice planting, harvest and circumcision. The special black bamboo for the Angklung is harvested during the two weeks a year when the cicadas sing, and is cut at least three segments above the ground, to ensure the root continues to propagate. 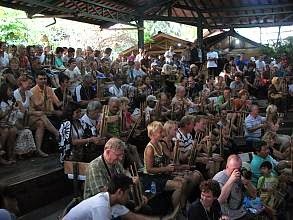 Angklung education is transmitted orally from generation to generation, and increasingly in educational institutions.